Charly O’Neills Famous Irish Pub was named after what it is. Famous. And Irish. It’s run by a guy named Pauric, though. Established in 1999 and located between the city center and the international neighborhood of Geneva, it is the ideal converging spots for diplomats and NGO workers exhausted from a hard day of saving the world. 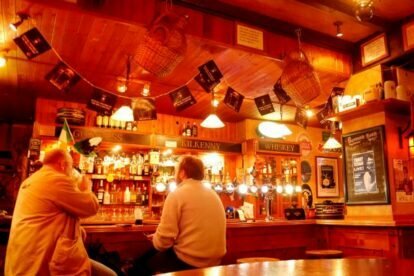 Whether they are in Geneva for three months or two years, they quickly find Charly O’Neills and make it their home away from home, wherever that may be. This means the pub is always full. After work drinks during the week, football on Sundays, there is always something to do there, someone to talk to. Every time I go there, I spend a few minutes checking out the framed quotes on the ceiling beams. They never change, but I always rediscover they make me laugh. During the sunny season, the terrace is always full of cheerful people talking the night away, cheering for their club, debating the latest move on the international chessboard. Only a few stops away from the airport, it is worth checking out even if you are only in Geneva on a layover. You’ll get to meet the real genevans. The expats.